This 4th of July headband for baby and toddler is a soft and stretchy crochet handmade headband that is made for the fashionable patriot! The flower is 4 inches Width. 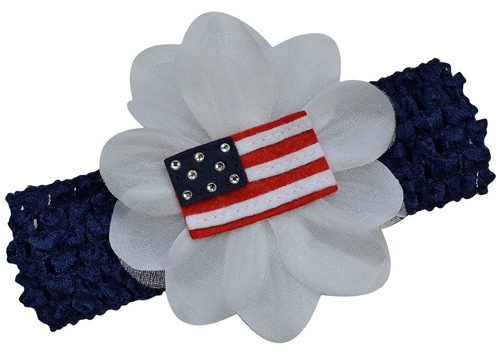 This American Flag Hair crochet headband is the perfect addition to any Red, White and Blue outfit! There are 3 available sizes; 2 inch Nylon for 0-12 Months, 1.5″ Crochet for 0-5 years+ and 2 inch cotton band for 5 years to adult. Features 4 inch hand layered silk and Organza Flower with a 2 inch american flag felt applique in the center. Great Headband for Parades or Red, White and Blue Festivities. Let your little firecracker shine with American Pride! 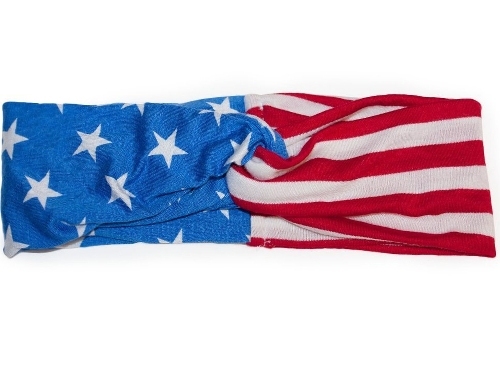 This American Flag headband is made of cotton poly blend. The fabrics are super soft knit and very stretchy. So the headband fit excellently with any sizes head. It is great for any hair day. It features a turban knot. The headband is adorable and will go with a lot of different outfits. If you wear this, then you will get tons of compliments. This American Flag patterned headband is the perfect accent for any hair day! Super soft knit. Very stretchy fabric. Features a twist turban knot.